After a few months of this soft gaze, we’ve concluded that we like Lucky’s a lot (thank goodness), but she has a few lazy habits. We love that we’re comfortable wearing khakis or dressed for a cocktail party. The Get Lucky & Go service is fantastic. Overall, the flavors are quite good, it’s a good value, and we really appreciate the wine selection and its fair pricing. Being able to make a reservation is great. The seasonal menus are fun and we order off them about half the time. We like the food from the Field Truck and find ourselves anxious to taste the flavors of Spring, even though we are enjoying the hearty fare of Winter. We especially appreciate that the service is courteous and efficient but not overly “familiar.” On the lazy side, we found that the house salad, the cheese bread, and the riso pasta and some other recipes need some attention. We also found ourselves thinking, “These restaurants make such an effort, especially considering their price point, to offer “honest fare” using local ingredients, that it seems to us that they ought to relate even more to the evolving food traditions of the South.” (I’ll bet that you’ll see the impact of this thinking pretty soon.) We could go into more detail about all of this, but we bet that you get a flavor for our thinking. Read on and you’ll learn about some romantic ways to celebrate your love/lust for your Valentine, our pretty wacky design process, a Winter recipe, and the calendar for upcoming menus. …or “Design Intervention,™” if you prefer. These names fit our approach to designing spaces for our guests. We wouldn’t recommend our process, even to our friends – sometimes it feels more like a curse than a blessing, but we have so much fun that we can’t imagine changing. The notion of writing about this came up because many people have quizzed us about “our process,” so we decided this would be a good way to answer. I know this sounds pat, but we “begin with the end in mind,” – the end always being “pleasurable and comfortable experiences for our guests.” We ask, “What, optimally, ought our guests experience when they arrive, while dining, en route to the restroom (this one is of particular interest to me),” and so forth. Then, after agreeing (which most often takes awhile), the Q-W Right Reverend Minister of Design, Don Rives, and I sit down and “commence arguin’” (we have never come to blows, but there have been some pretty dramatic demonstrations of exasperation). From here we agree upon a sort of “vignette.” For instance, with the Green Valley Grill, the vignette was a fantasy that we had discovered an early 1900’s brick, Tuscan-style building that had once housed a mill or a store. With our Cary Lucky 32 restaurant, we began with a fantasy of a freestanding “art-deco” styled post-war grocery store. So, the first step with both of these projects was to design what we “discovered,” then we designed the restaurants to fit that aesthetic. With the O.Henry Hotel, we wanted it to appear as though it were built as any city’s best hotel at the turn of the last century. We pretended that the late Charles Hartmann, the architect for the 1919 vintage O.Henry that stood in downtown Greensboro, was our advisor. We studied the design of the original O.Henry, and other Hartmann buildings, to come up with the various architectural features that we thought Mr. Hartmann would insist upon. Then we commissioned Chip Holton to create a painting of a hotel incorporating those features in the proportions we imagined. Only after all of that did we start putting lines on the architectural drawings. We’d be real surprised if you are not as pleased as punch if you choose our O.Henry Hotel and Green Valley Grill for your wedding events and your out-of-town guest accommodation needs. We’ll bust our cans to make sure you say what Mrs. Juli Jadick said, “Gracious Amenities. Attentive Staff. That is your motto and it is so evident! I wanted to let you know how fantastic your staff was during the planning and the weekend of my wedding. We held a rehearsal dinner in the Pavilion and Leslie was a joy to work with.” (We’re not making this up — we aren’t “Madison Avenue” enough to spin such a yarn.) 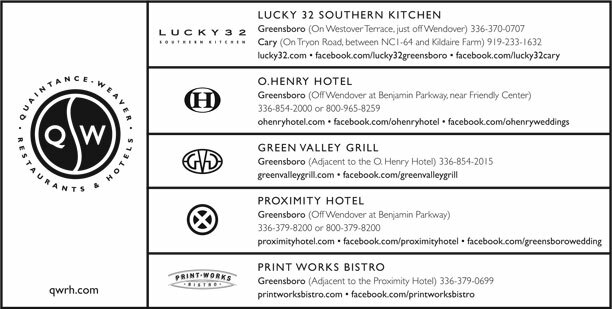 Visit o.henryhotel.com for more information, including menu samples, or contact Leslie Dupuis at 336-544-9609 or ldupuis@qwrh.com. The O.Henry Hotel has been awarded the AAA Four Diamond Award for the fifth year in a row, plus we’ve been rated in Canada at the same level. We’re thrilled that our hotel has been chosen for this top-notch rating yet again. We now have Hi Fi Sony Stereos with CD players and AM/FM radios in each of our guest rooms so our guests can enjoy their favorite music. The O.Henry has been accepted for membership in Boutique Lodging, a worldwide, online network of boutique hotels. The O.Henry is the only hotel in NC to be accepted. We recommend visiting their site if you are looking for a small, distinctive hotel, no matter where you’re travelling. Local artist and sculptor, Jim Gallucci, is installing an elaborate design in our guest elevators that include an “O.Henry twist.” Stop by anytime to see his craftsmanship. We’ve chosen the name “O.Henryetta” for our London Taxi. Thanks to Jayne Ericourt for being the first of about fifteen people to suggest that name. Now we want to know, what do you think the O. stands for? If you have any ideas drop me (Dennis) a line at dq@qwrh.com.